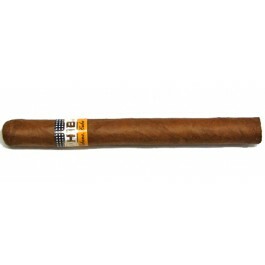 The Cohiba Exquisitos is one of Cohiba’s gem, a modern yet strong Seoane format, of 36 ring gauge, 4.9” (125mm) long and comes in 5 packs of 5 cigars. One of Habanos aficionados' first pick for a short smoke break. Rich smoke, with typical Cohiba grassiness, coffee and sweet tobacco. Delicious short smoke. Good combustion and draw make this seoane by Cohiba a lovable Habano whose company is short-lived. 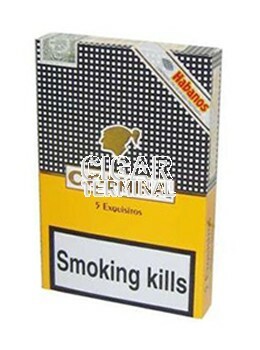 All the virtues of the brand in a smoke of originated from the surname of the Spanish gentleman who user to have them specially made according to his own specifications regarding format and blend. It doesn't have the advantage of large shapes, but this made of this Havana the ideal cigar for short breaks. Many connoisseurs have always some SEOANE in their office humidors. In a congress or in a Forum, between two meetings, you can have a short break in "the smoking area". Tin containing 5 Havanas, individually wrapped in cardboard. Cedar notes and hints of black honey.